My husband was working at a house recently where an elderly German couple lived. While he was working there, they were cooking a Potato and Leek Soup. He came home and told me how much he loved the smell of the soup and asked if I would try and make a Potato and Leek Soup. So I did, as that is what I do, as I know my husband loves soup. Now I don't know the recipe of the soup the elderly couple made, but I came across this recipe and it is really good. My whole family loved this soup. I have since made it a few times. It is very easy to make, and tastes absolutely delicious. Now you can eat it as is, but I decided to add bacon and croutons to it, for added flavour. Can I just say, this makes my family go a little crazy for it. Croutons are very popular in my house. Also I blitz the soup with a hand held blender, less cleaning and they are very practical to have. But if you only have a normal blender, simply do it in batches, don't fill the blender more than halfway full, leave the hole in the lid slightly open, to allow steam to escape but please remember to place a tea towel over the lid incase of splatter and to ensure you don't get burnt by the steam. So keep it simple or add bacon and croutons, just remember to try it, it will not disappoint. Croutons: Preheat the oven to 180C/160C fan forced. Split the breadstick in half, then chop up the breadstick into bite sized croutons. Place the bread on a baking tray lined with baking paper. Melt the butter, add the oil to it. Pour the butter mix and garlic over the bread, mix to coat the bread with the butter. Place in the oven for 10 minutes, remove from the oven and allow to cool. Season with a little salt. Melt the butter over medium heat in a large saucepan. Add the leeks and garlic, and sauté, stirring regularly, for 10 minutes or until the leeks have softened. Don't allow the leeks to colour, you want them softened but not browned, reduce the heat if needed. Add the potatoes, stock, bay leaves, thyme and a little salt and pepper. Bring to the boil. Cover, reduce the heat to low and simmer for 15 minutes or until the potatoes are very soft. Bacon: Meanwhile, fry the bacon in a non stick frying pan until crisp, drain on absorbent paper or in a colander. Remove the bay leaves and thyme sprigs from the soup. Now blitz the soup with a hand held stick blender (see notes above if you only have a normal blender). Blitz the soup until smooth. Add the cream, bring back to a simmer. Taste for seasoning now, add more if needed. If you feel the soup needs to be thicker, keep it simmering until thickened to your liking. If it feels too thick, add a little extra water to thin it out. 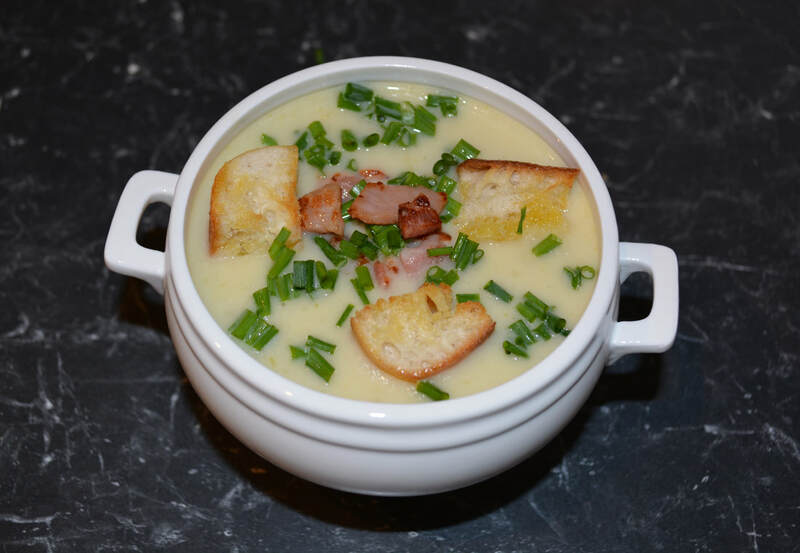 To serve, place the soup in a bowl, sprinkle over the bacon, croutons and chives. Serve immediately.